BULLS GAP, Tenn. (July 8, 2017) — The largest weekly crowd of the season Saturday at Volunteer Speedway was entertained with an exciting five division racing program and a total of seven action-packed feature events. 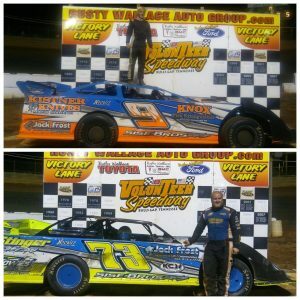 Trevor Sise of Knoxville and Chase King of Seymour each captured Steel Head Late Model victories, while Ross White of Knoxville recorded the Crate Late Model win. Zach Sise of Knoxville captured the Sportsman Late Model win, with Chris Rickett of Morristown getting the Modified Street victory. Will Carey of Knoxville and Richie Overholser of Corryton each recorded Classic wins. The top three in Steel Head Late Model qualifying were very close, with Chase King timing-in fastest at 13.939 seconds and Trevor Sise barely behind at 13.959, followed by Austin Neely at 13.967. King and Sise led the 21-car field to green from the front row for the 30-lap main event, with Sise powering out to the lead over King and Cory Hedgecock. Over the opening laps the action was exhilarating on the high banks with several competitors fighting for position behind the lead trio including Neely, Jason Cardwell, Layne Clifton, Bobby Mays, Ryan King, Josh Henry, Eddie King Jr., Drew Kennedy, Dakotah Knuckles, Gary Crittenden and Greg Estes. With the race running clean-and-green, Sise was in command out front holding comfortable advantage over King and Hedgecock, who were battling lap-after-lap for second place. Hedgecock would stick his nose underneath King racing up off the corners, but on each occasion King held Hedgecock off to maintain the position. The event’s first caution waved on lap 25 when Kennedy suddenly slowed on the backstretch, and off the ensuing restart only one circuit back under green the yellow flag waved again when Ryan King spun. Would Chase King or Hedgecock be able to overtake leader Sise in a four-lap shootout for the victory? With the green flag waving Sise rocketed down the front straightaway and would not be denied his first win of the season over Chase King, Hedgecock, Cardwell and Clifton. Completing the top 10 finishers were Mays, Neely, Henry, Knuckles and Crittenden. In the second Steel Head Late Model feature (makeup from rained-out race back on June 23) King launched into the lead at start over Cardwell and Henry. With King setting a blistering pace over the first half of the race he held a comfortable advantage over Cardwell, but the distance began to shrink with 10 laps remaining as Cardwell closed right in behind King. But King held his ground en route to capturing his second win of the season in a close finish over Cardwell, Henry, Crittenden and Mays. Ross White jumped out to lead over Cory Hedgecock, Tim Byrd, Tim Maupin and Philip Thompson at start of the 30-lap Crate Late Model feature. While White was flexing his muscle out front, behind him Hedgecock and Byrd were battling for the second spot. Behind White, Hedgecock and Byrd, the racing action was intense with a tight pack jockeying for real estate around the high banks involving Maupin, Thompson, Gary Crittenden, Josh Henry, Pierce McCarter, Jordon Horton, Jason Trammell, Adam Tolliver and Bryson Dennis. Maupin and Thompson began to fade, slipping back several positions as the race reached the halfway distance. With five laps remaining, Hedgecock closed to the back spoiler of leader White. But White never missed a beat and went on to pick up his third win of the season over Hedgecock, Byrd, Crittenden and Henry. Zach Sise set fast-time at 14.336 seconds in qualifying to earn the pole starting position for the 20-lap Sportsman Late Model feature. The 17-year-old Sise grabbed the lead on opening lap over Chris Coffey, Heath Alvey, Tyler Smith and Aaron Guinn. Caution waved on lap 7 when Bubba Long spun in turn three at the back pit gate. Off the double-file restart Sise was showing the way out front over Coffey and Alvey while Guinn, Jonathan Miracle and Rex Coffey all got past Smith shuffling him back to seventh in the running order. Guinn passed Alvey for third on lap 10 racing off the fourth turn and quickly closed right in on Chris Coffey to challenge for second place. While Chris Coffey and Guinn raced side-by-side down the stretch battling for the position, Sise rolled to a convincing flag-to-flag victory over Chris Coffey, Guinn, Alvey and Rex Coffey. Chris Rickett jumped out to lead over Wayne Rader, Michael Woods, Austin Atkins and Robbie Buchanan at start of the 20-lap Modified Street feature. Atkins passed Woods to move into third place as they raced off the fourth turn on lap 4, and closed in behind Rader to pressure him for second. With leader Rickett, Rader and Atkins working slower traffic on lap 14 racing up off (turn) two, Atkins pulled alongside Rader racing down the backstretch into the third turn where he pulled off pass for the second spot. Rickett held Atkins off for his fifth win of the season, with Rader, Woods and Buchanan rounding out the top five finishers. A strong 15-car field of Classic cars took the green flag for their 20-lap feature, with Will Carey taking the lead on at the start over Richie Overholser and Tom Juhl. Behind them Hayston Collett, Scott Lacey, Tony Trent, Tim Stevens, Luke Ellis and Chad Manning were battling for position. Overholser looked to inside of Carey repeatedly lap-after-lap trying to make pass for lead, but Carey held the advances off en route to capturing his first-ever victory. Carey was chased to the checkered flag by Overholser, Juhl, Trent and Lacey. In the second feature for the Classic division, Overholser recorded his fourth win of the season over Manning, Trent, Carey and Jason Hartsock.